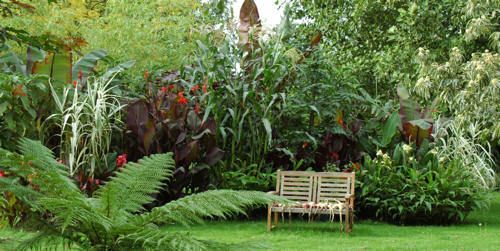 JungleSeeds is a company dedicated to providing information, seeds and plants for those of you wishing to grow Exotics. Whether your interest is for tropical summer bedding, hardy planting or for growing exotics under cover, we have tried hard to provide a wide range of exciting and unusual seeds and plants alongside more traditional and unusual seeds. We hope you enjoy this years updated web-site. Most of the seeds available though have pictures to help you see what they look like and the thumbnails are hyperlinks to high quality pictures. We offer high quality seeds and plants, promptly delivered to your door. Regular visitors to our site will see the seasonal changes, with interesting articles and special offers, many only available on our web-site. JungleSeeds is an established Company located in South Oxfordshire, and we have been selling seeds on the internet since 1999. 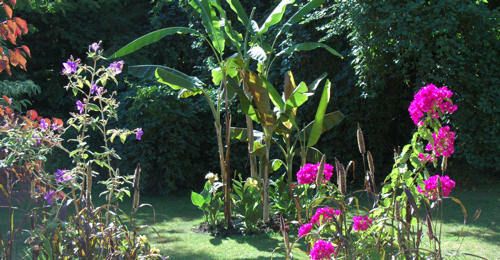 We specialise in supplying tropical seeds, tropical plants and some associated greenhouse products. Our tropical plant range includes plants for summer bedding purposes plus many rather unique plants for the keen enthusiast with warm greenhouse conditions. We are a husband and wife management team with a growing band of enthusiastic workers to support our expanding business but we are still small enough to add that personal touch to your enquiries. Our principal growth focus is towards seeds as the infrastructure required on plants is more difficult and was initially only set up as an offshoot from growing our own seeds. However we currently stock in excess of 5000 tropical plants in heated greenhouses and Polytunnels and propagate most of these ourselves. History - my own background has been in the computer industry since University days but my family has been in the gardening business for many generations originally from Kent. However this horticultural focus died out two generations ago until I picked it up again. I will always remember at 4 years old walking through steam heated greenhouses full off growing plants on my grandfathers nursery. I hope that what we have created through JungleSeeds would have been appreciated by my grandfather and a favourite long lost uncle, who's horticultural skills will always outweigh anything I can ever hope to achieve. Thank You We would like to take this opportunity to thank everyone who has been kind enough to place business with us over the years Especially those who have had extended delivery times for the rarer seeds on offer. We plan to continue increasing our range of Seeds varieties and you will find in this years Web Site many new fascinating introductions. To cater for customers who perhaps like me, are always looking for the unusual, we are continually searching for rare choice items to add to our portfolio. However many of these will be in short supply because of propagation limitations and are offered on a limited availability scenario. Plants We have reduced the number of plants we sell as part of a retirement plan but continue to concentrate on offering some of the more rare items not easily found either online or in Garden Centres. We are pleased to offer on-line ordering through our secure server arrangement with professional "Shop Factory" software on both of our seeds and plants web sites.. Growing Tropical plants from seed can be a challenge but it can also be very exciting and rewarding. You don't have to convert the whole garden to a tropical theme but some of our seeds produce some unusual and architectural plants that will look stunning in most gardens if placed in the right position. Living in a thatched property we have always enjoyed a cottage garden look and we have therefore included annual and perennial seeds of some of the best that we think enhance exotic border displays. We also have an extended vegetable seed section with many unusual items and seeds of some of my favourite varieties that have a proven track record on our own vegetable patch. Seeds We carry out seed germination trials on most of our seeds, but the range is growing so large that we cannot check every quantity purchased. Many of our customers feedback their results, some excellent some poor, and we do take all of this input on board and we have removed a number of non performing varieties for this year. However, due to the nature of our exotic range of seeds, some varieties are more challenging and may require more care and patience to grow than other less exotic varieties. Without knowing every detail of your own germination environment, it is difficult for us to advise as to what may have gone wrong (or right!) and please forgive us if we do not always have the time to answer all of your email enquiries on this subject.